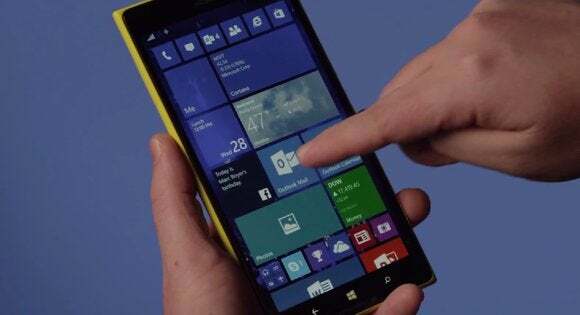 The Windows 10 technical preview for phones doesn’t walk up, slap you in the face, and demand your attention, as Windows Phone 8 and its Live Tiles did. But you can detect a subtle power, even at this early stage—and one very nice feature: deeply integrated speech recognition. Right now, I’d characterize Windows 10 for phones as a convenience. That’s not a criticism. Features like interactive notifications or the improved Quick Actions may be nothing new for iOS and Android phones. But who cares? They’re useful nevertheless. Aesthetically, there are few changes between Windows Phone 8.1 and Windows 10 for phones. Windows 10 for phones is also not for everyone—yet. I have four Windows Phones within reach, at least two more at the office, and one in my wife’s hands. None were approved to download Windows 10, and thus I had to ask Microsoft to loan me back the Lumia 830 we reviewed last year. After evaluating it overnight, I’d say this: If you own a single Windows Phone and are considering taking the plunge into what is essentially alpha software, I’d hold off for a bit. I'm assuming your phone is a lifeline for your business and personal lives. There are bugs, though nothing I did crashed the phone. On the other hand, if you have a spare that Microsoft has approved to receive the updates—sure, why not? In general, Windows 10 for phones felt a mite clunky in places, especially with animations, but otherwise ran smoothly. The improvements that Microsoft added in this version of Windows 10 fall into two categories: functionality and aesthetics. And the integrated speech recognition is the best of the bunch. Microsoft says that speech will basically be an option in most if not all text fields, allowing you to dictate what you’d normally type. I personally use digital assistants like Cortana and Google Now quite routinely, and feel comfortable quietly setting a reminder or asking a question with my phone held close to my mouth. 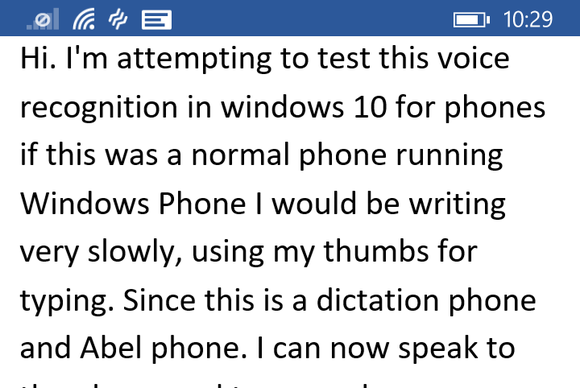 The one thing Windows Phones don’t really do, however, is allow you to dictate text. 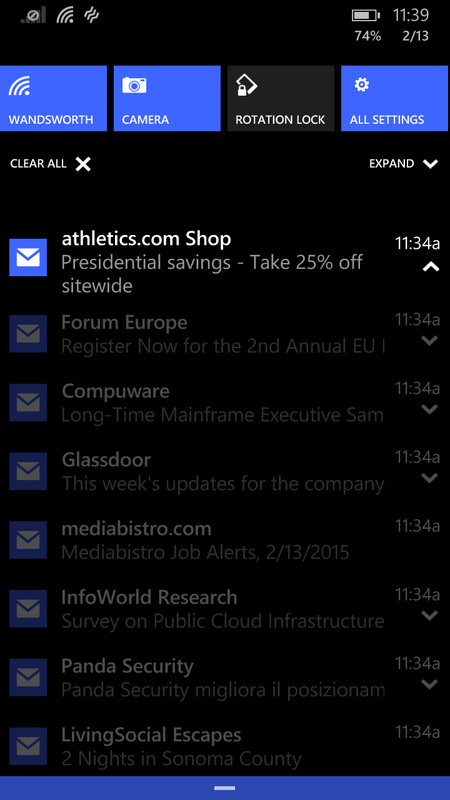 (Yes, you can talk to Cortana, Microsoft’s digital assistant, and even dictate SMS text messages. But that’s about it; you can’t dictate an email at this point.) If you want to take a note in OneNote, you must type it, or else record an audio snippet to be transcribed later. 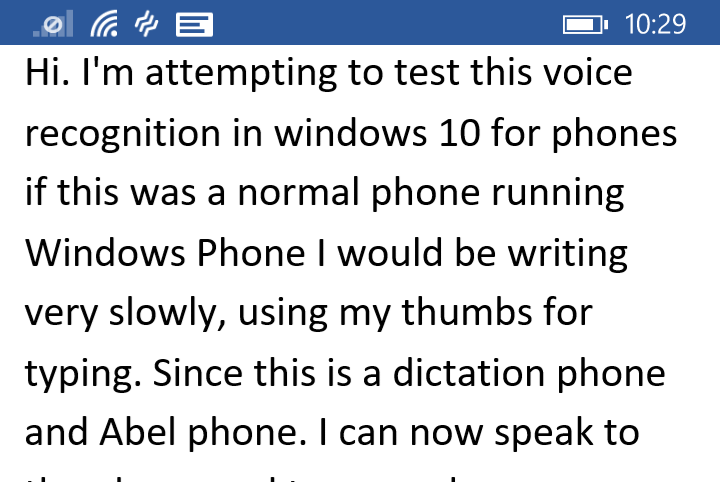 Windows 10’s voice dictation works well, and adds another layer of productivity to Microsoft’s message. 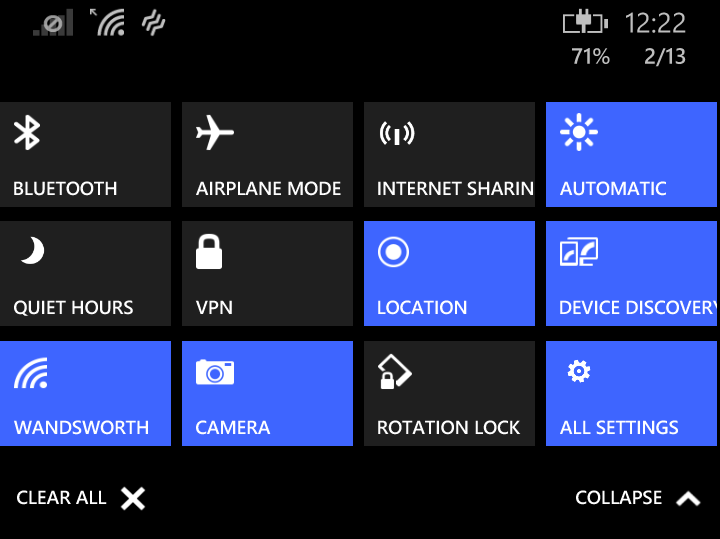 In Windows 10's phone preview, the Settings menu is less jumbled. Google has offered speech input for some time, although it may be a feature you have to enable on your Android phone. But while Google’s speech recognition requires you to dictate the word “period” to end a sentence, Microsoft intuits it from your voice and sentence structure. It’s not perfect, but Windows 10 generally gets it right. Interestingly, it’s also somewhat speaker-independent. My wife was able to use my phone to “type” a sentence with her voice, too. If this proves to be the case, letting Windows 10 phones transcribe a college lecture into OneNote would be a useful tool. 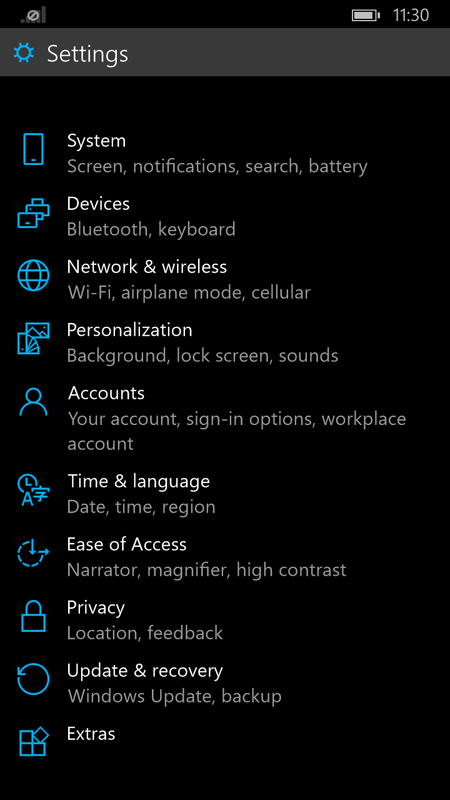 The current Windows Phone 8.1 Settings menu feels like a junk drawer of odds and ends. I have a vague feel for where current settings live, and how quickly I need to swipe down to find them. But a lack of alphabetical (or any) order, really, is confusing. 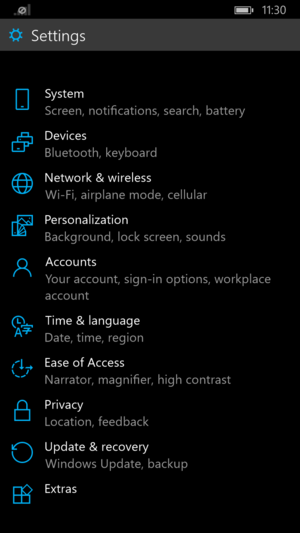 Windows 10 solves that problem by organizing the Settings menu into a few neat subcategories, making it much easier and more intuitive to find what you’re looking for. Windows 10’s improved Action Center adds a number of shortcuts to common tasks. An improved Action Center—the settings shortcuts that can be accessed by swiping down from the top of the screen—also means you won’t have to access the menu, period, as frequently. 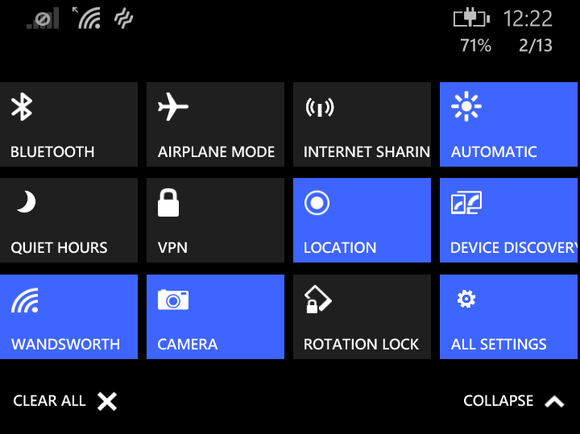 In Windows Phone 8.1, you have about five to choose from: Wi-Fi settings, Bluetooth, airplane mode, rotation lock, and the brightness controls. With Windows 10, there are a dozen, including toggles for VPN and do-not-disturb Quiet Hours, location, the camera, and more. You can swipe this message away, if you’d like. Many of the basic features of modern phones—and this includes Android and iOS as well—are designed to keep you from diving deep into apps and menus, or at least point you straight to what you want to do. Windows Phone 8.1’s notifications provide a long list of email from various accounts, reminders, and app notifications as well. With Windows 10, you can begin to act on these, swiping an email to the right, for example, to archive it. You can do the same, according to Microsoft, with new texts and other messages that appear as so-called “toast” notifications at the top of the screen. (I personally haven’t tested this feature yet.) Microsoft says you’ll be able to tap on the message and quickly respond to it, without leaving the app. The apps menu also shows a section of “recently installed” apps at the top of the screen. The technical preview of Windows 10 for phones and small tablets also includes a look at one of the new “universal apps,” Photos. Microsoft’s new Photos app in Windows 10. The look and feel of universal apps will be the same no matter whether they’re on a phone, tablet, or PC. On Windows Phone 8, the Photos apps places a slight border around each image, and it only shows images stored on the phone itself. On Windows 10, Microsoft has removed the border, and Photos now displays images on the phone and on OneDrive. 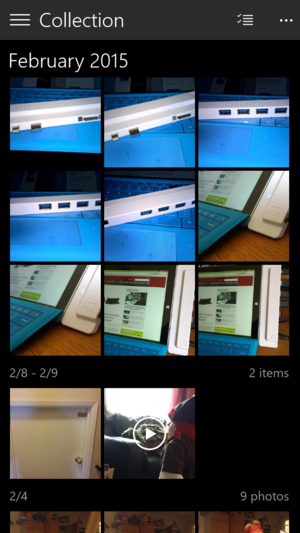 Moreover, Photos includes the “albums” feature Microsoft added to OneDrive last month. About the only bug I found is that photos taken with the phone don’t seem to upload to OneDrive, even if backup is turned on. There’s one other feature that may be of interest within the technical preview: a small “joystick” that appears within the soft keyboard. When editing text, Microsoft’s Windows Phone highlights entire words by default, making typos (such as a mistyped character in a password) difficult to correct. The joystick steps in and allows you to step through words, character by character. The last improvement is strictly aesthetic: Microsoft has changed the Live Tile structure again, so that you now can add a background. 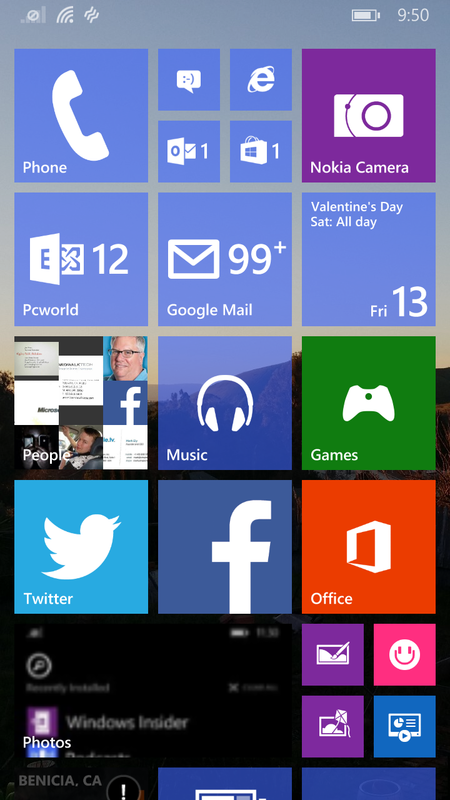 That’s a slight change from Windows Phone 8.1, where the “background” is contained within the Live Tiles itself. Now, it swims “underneath” the tiles themselves. Note the blue dot to the bottom left of the screen. 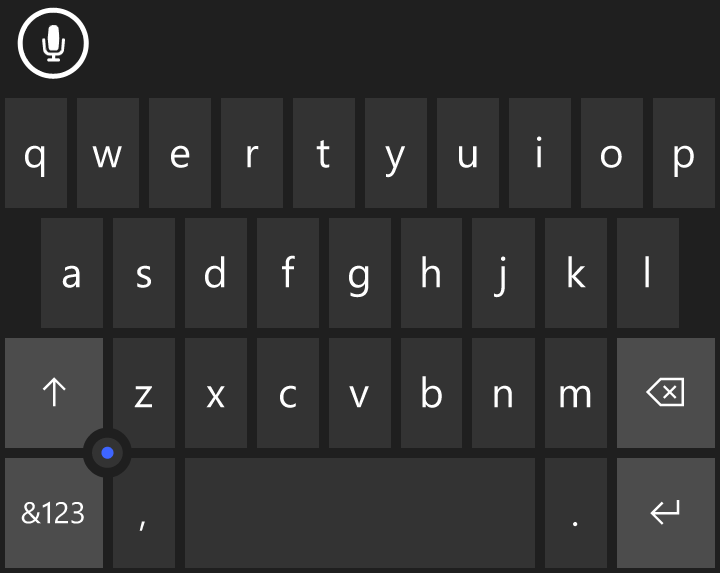 This new Windows 10 for phones “joystick” allows you to step through text, character by character. I’ve said before that Windows 10’s goal isn’t to sell a particular device or operating system, but to sell the integrated Microsoft ecosystem as a whole. I continue to believe that Windows 10 isn’t moving so much ahead as laterally, tying other Windows devices more tightly together. As a whole, however, Windows continues to improve. I’m eager to see what subsequent builds have in store.